Current US President Donald Trump is on record as repeatedly saying that "The murder rate is the highest it's been in I guess 45-47 years." NO! The EXACT OPPOSITE is true. According to this comprehensive listing showing data from 1960 to 2015 shows the highest absolute number of murders (24,700) occurred in 1991. The highest per capita rate (10.2) occurred in 1980. If anything, the data shows that the period of 2010 to 2015 has been historically LOW for murders. Pew has similar numbers. As well as showing that people are totally unaware of the fact that rates are at historic lows. So the definition isn't cherry picked either. No, 2015 was the highest since 2009, but it was much higher previously, according to the Death Penalty Information Center. According to the FBI Uniform Crime Reports, via Politifact, the increase in the murder rate (10.8% from 2014 to 2015) is the highest in 45 years, but obviously that is different from the quote in the OP. Full year statistics for 2016 are not yet available, but the FBI reports that for the first half of 2016 murders were up 5.2% over the first half of 2015. 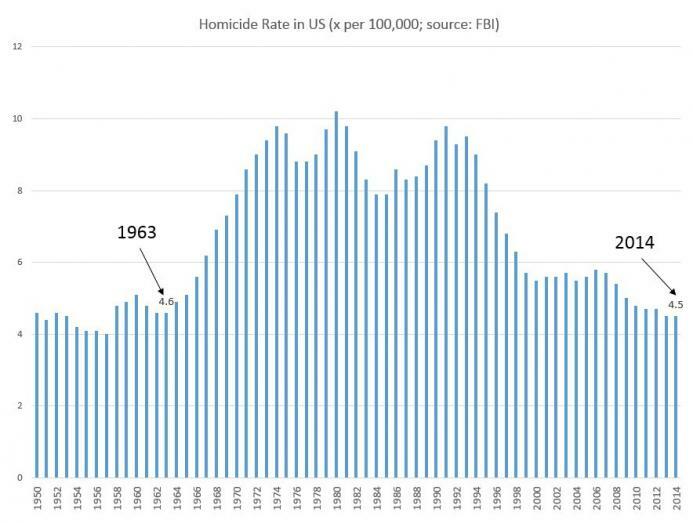 No, the US Murder Rate is not the highest it's been in the past 45 years. According to this page from fbi.gov, the murder rate and the total number of murders for the year 2015 is lower than every year between 1996 and 2008. Note that the data for 2016 is not available yet; however Donald Trump has been quoted as saying this at least as far back as October 26th, 2016. According to FBI data, the rate of murder and nonnegligent manslaughter in 2015 was 4.9 per 100,000 inhabitants. That’s lower than the rate in 1970, which was 7.9 per 100,000 inhabitants, and it’s lower than the peak rate of 10.2 per 100,000 inhabitants in 1980. Overall, the rate in 2015 was lower than any other time between 1965 and 2009. No, but the rate is increasing at its highest acceleration in 45-47 years. This might be what he meant. Not the answer you're looking for? Browse other questions tagged united-states criminology violence .